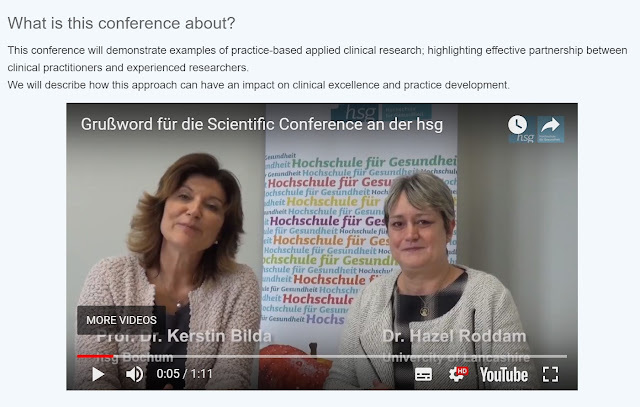 ResNetSLT - Research Support Network: Wilkommen! Va bene? Thank you to Hazel Roddam (@HazelRoddam1) for producing the latest ResNetSLT blog post. Have you seen all our new international friends who've started joining us on #ReSNetSLT? It's been exciting to 'tweetmeet' with a growing number of new connections from across mainland Europe. A special warm welcome to Germany and Italy, who have been very active in joining our recent monthly Twitter journal club discussions. This is such a great opportunity for immediate real-time contact with colleagues with no barriers of geography, or professional discipline. I've just heard a new phrase today - 'connectography, not geography'. That seems so appropriate for us! Do you like it? Here's some news about a unique conference in September - watch the video clip to hear more. We're bringing together practitioners and academics in nursing, midwifery and health sciences from all around Europe to share inspiring examples of applied research to change practice. Please share the link for this conference and download the event flyer and full programme here. We’d love to see you there! (PS: Yes, we'll be in Germany but the conference language is English). Thanks to all the willing volunteers in our new ResNetSLT Action Group. We've had a great start to the year with lots more regular posts on our blogsite. These viewpoint pieces are a great way to share personal experiences and reflections about getting involved in clinical research. Posting photos helps us feel we're getting to know each other too. Who's going to be the first to start posting comments in reply to continue our conversations?